I originally had this under the Hearst page when I realized that it deserves its own full write-up, because in northern Ontario it’s just as important as any town or monument. Yes, I’m talking about Chinese food. 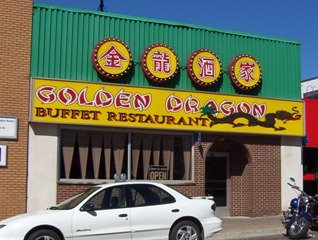 Are you sick of the half-assed Chinese food found in most Chinese restaurants across Ontario? Well you’re in luck. Northern Ontario has its own special variant. I’ve been asked if I want spaghetti fried rice. Or if I’d prefer fries instead of chicken chow mein. Or if I’d like my noodles on a hamburger or on their own. Chinese food in northern Ontario sometimes comes with ketchup. I’ve heard people order extra gravy for their fried rice. Some people ask for extra sauce on their chicken balls, to the point where everything is so contaminated with that bright pink sauce that the chicken balls seem candy coated and may be mistaken for tiny candy apples or the brightly coloured testicles of one of those African monkeys. Watch for the cubed bits of chicken, and carrots and celery cut so straight that they have to be using drafting tools in the kitchen in order to chop with such precision. It’s so versatile. You order almond chicken? Bring out the T-square, do some precision handi-work, throw a few almonds in, heat and serve – voila! You order chicken chow mein? Do the same, throw in a few sprouts (defrosting optional), heat and serve – voila! See? If you order chicken fried rice and you get rice with a few lily-white shards of chicken on top, don’t look puzzled. Au contraire mon chum, often chicken fried rice means fried rice with some chicken on top. It’s not called “chicken fried in rice”, so why assume that the chicken has been fried up with the rest of the dish? That’s not a mistake, that’s just how it is done. And then there’s the toast. 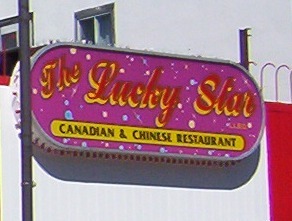 Chinese food almost always comes with toast in northern Ontario. And it’s never served plain. Sometimes even buttered on both sides. I’m told that the toast comes with the meal in order to sop up the excess sauce/gravy/chicken-ball-pink-stuff you’ve ordered with your Chinese food. Some have told me that the toast is there simply to help you push your fried rice on to your fork because, and lets be honest, unless you’re ordering a steak no-one in northern Ontario ever makes use of the standard-issue restaurant butterknife that is set out with your fork and napkin. Others have told me that the only reason they give you a fork is to help you heap your fried rice into your bread, because otherwise the rice falls between the tines of your fork. Go figure. This toast business, I have found, is a regional thing. In Timmins, you might get toast with your meal, you might not. In Iroquois Falls, you tend to get a single piece each. In Hearst, a meal for two gets a full blown stack of six slices. All buttered. If you think normal Chinese food in some restaurants can be, well, “unique”, then just wait – the Chinese food in northern Ontario is like its own species. And that’s why it has sooooo much more ‘character’ than its southern counterparts.